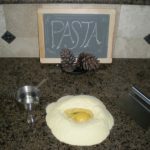 Recipe: MYO Homemade Pasta, easy and cheap! Once I began on my voluntary simplicity journey I became interested in how to make more of the items my family consumed. I knew in doing so it would be healthier, less expensive and gentler on the earth. I learned to make my own spice mixes and I cooked more from scratch. A garden was planted & expanded each year. And I learned to make things such as yogurt and pasta. I found much pride and enjoyment in learning old-time methods. Like many of the things I’ve learned to make myself, I was shocked at how easy and inexpensive pasta is to make and how few basic ingredients are involved. Had I really become so far removed from my food that I was under the misconception that it was too difficult to provide this for myself?? And I’ve experimented recently with making flavored 3-color Pasta too! But let’s talk about plain pasta today. So versatile, so easy! Other than water there are only 3 ingredients in my pasta recipe: Flour, Egg & Salt. Wanna be amazed? Here’s how easily it all comes together. I start by measuring two cups of all-purpose flour on my counter. Some use special semolina flour for making pasta but I typically use plain ole all-purpose flour for mine. It always turns out delicious. Use whatcha got! Today I took advantage of the oregano I recently harvested & dried from my garden. I sprinkled about 1/2 teaspoon of the powdered dried oregano right into the flour. This will add an Italian flavor to my pasta. I added 1/2 teaspoon of salt and stirred it all together with a fork. Then I made a little well in the middle of my flour mountain and cracked an egg into it. I stirred the egg with my fork until it was mixed well. Then I slowly added 1/2 cup water, stirring with my fork and gradually incorporating more & more flour until it became thicker. Finally I mixed it all together with my hands as it became a dough. I knead it until it’s smooth. (maybe around 4 minutes) The dough is then divided into 3 equalish pieces and covered with a towel, allowing it to rest for 15 minutes. After the dough has rested you can roll out the pasta dough and cut it to the length & width you like. You can accomplish that with just a rolling pin and a knife of course. But I was given this *Pasta Machine years ago as a gift and I love it. So I typically use it instead. 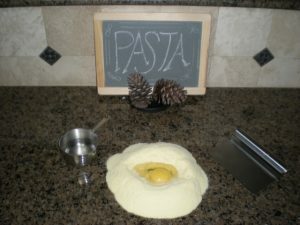 Although I can roll the pasta on my own, it’s helpful for two people to work the pasta roller: someone to feed the dough and catch the ribbon of pasta that comes out the bottom and someone else to turn the crank. So this meal typically becomes a shared family activity for RancherMan & me here on the homestead. Love it! Measure 2 cups all-purpose flour on a counter and stir in 1/2 teaspoon salt. Make a well in the center of the flour and crack an egg into the center. Slowly add 1/2 cup water, mixing with a fork and gently incorporate the flour into the egg mixture a little at a time. Once you have incorporated the flour with the fork, use your fingertips to blend the mixture well. If the dough seems too dry add 1/2 teaspoon of water, if it seems too wet and sticks to your fingers add a light dusting of flour. Form a ball with the dough. Knead the pasta dough as you would bread dough, pushing down and away with the palm of your hand, turn the dough 1/2 turn, fold in half and press again with the palm of your hand. Repeat this movement until dough is smooth, about 4 to 6 minutes. Cut the dough into 3 equal sections, form each section into a ball and cover with a towel and let rest for 15 minutes. After the dough has rested, flatten one of the dough balls until it's about 1/2 inch thick and roll into the desired thickness. Then cut the dough into noodles. After cutting the dough, hang the pasta on a wooden dowel to dry. The pasta can be used right away or it will keep for about a week after thoroughly dried. 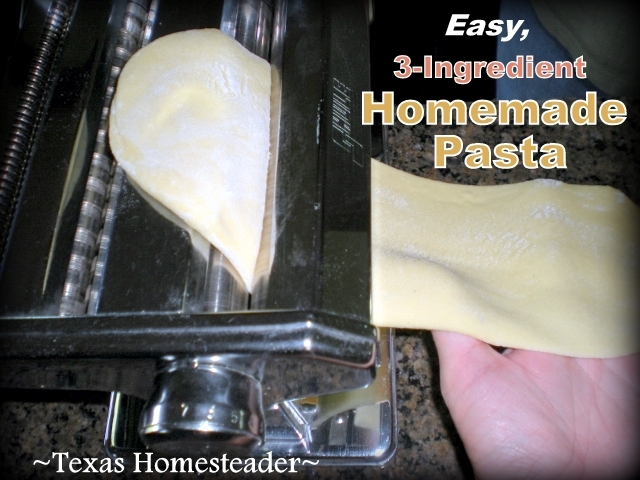 Homemade Pasta – Only 3 Ingredients! * A word about our Affiliate Link – We are currently enrolled as an Amazon Affiliate. So occasionally I will insert an affiliate link into one of my posts if I think it may be of interest to you. (in this case a pasta machine.) I purchased the pasta machine myself and receive nothing from the manufacturer. But I love it & thought you might too. If you click on any of my affiliate links and buy something (almost anything, not just what was linked) I get a small referral percentage from Amazon. But here’s the really important part – the price you pay for your items is UNCHANGED. This entry was posted in Blog Posts and tagged Cooking, Frugality, Make-It-Yourself, Recipes on July 19, 2013 by Texas Homesteader. I was just thinking about making my own pasta last night! I’ve never tried it, but I recently made my own ricotta cheese and am so excited with that success. I heard that making noodles isn’t too difficult and so worth it. It’s perfect timing that I saw your post today. 🙂 I might try to add in some whole wheat flour just because I love the texture it gives to things. Plus, hubby’s a health nut. Would you please tell me which final number on the dial you used for making the lasagna noodles? Thank you. I LOVE making pasta! Once you do it is hard to go back isn’t it? What filling do you use in your ravioli? I have the latest MJFarm Magazine marked to make the Pasta recipes in there including the pasta. Thanks for sharing the steps for this. Everyone should try this! My husband loves making home made pasta. For Christmas I got him the Kitchen Aid Pasta maker and I got him a ravioli kit too. I will have to show him your recipe. Thank you for joining us on our Four Seasons Blog Hop. Pinning Now. Hi Tammy! Thanks for sharing the recipe! I hope to make it soon and use my homemade Italian sausage for the filling! Have a great day! Blessings from Bama! 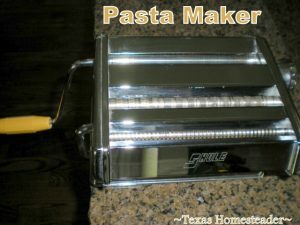 A pasta maker has been on my wish list! I learned how to make pasta years ago in 4H and haven’t made it since (40+ years ago). I think it’s time to dust off the pasta attachment to my Kitchen Aid and see what happens! I also read on a blog about a month or so ago that you can forgo the water and add a pureed vegetable instead – like carrots – to make the pasta a bit more on the healthy side! Thanks for sharing your recipe! I once saw Alton Brown (on the Food Network) clamp the pasta machine to one end of an ironing board; with a clean cover of course, and rolled the pasta to the desired length. This method enabled him to make the pasta by himself!! I haven’t made my own pasta in awhile and it is really simple to do. We made homemade perogies and lasagna noodles awhile ago and they were so delicious! Thanks for linking up to the Friday Follow Along. What a great tutorial. So easy! I’ll bet it tastes amazingly fresh. I guess you cook it less? I love, love the chalkboard sign in the background!! 🙂 I have tried egg noodles a few times but never pasta. I got an attachment for my Kitchen Aid Mixer but haven’t messed with it much. This is definitely on my list of things to master! Thanks for the recipe!